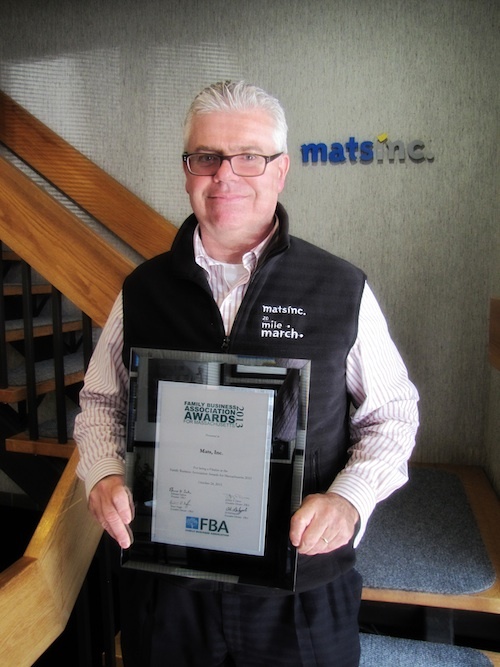 Mats Inc. was recognized as a finalist by the Family Business Association at the annual Awards for Massachusetts event held at the Royal Sonesta Hotel in Cambridge, Mass. on October 24, 2013. The Family Business Association, Inc. is an independent non-profit organization focused on providing educational services and information to family business enterprises and dedicated to recognizing the accomplishments of all Massachusetts family businesses and their contributions to the economy. An independent panels of judges evaluated nominations for four categories including first generation businesses, large businesses with more than 150 full-time employees, mid-sized businesses with 50 to 150 full-time employees and small businesses with fewer than 50 employees. Judges selected twenty-two finalists from more than 450 nominations whose business practices have had a positive impact on their business sector and the community. These companies have strong track records of success, family involvement, community service, innovation and a positive family business structure.